A public memorial service for late astronaut Neil Armstrong, the first person to set foot on the moon, will take place Sept. 13 at Washington National Cathedral in Washington, D.C. The event offers a chance for the nation to pay its respects to the iconic astronaut, who died Aug. 25 following complications from a recent heart surgery. A previous ceremony was held for Armstrong on Aug. 31 in Cincinnati, but that one was limited to friends and family. The Sept. 13 service is scheduled to begin at 10 a.m. EDT (1400 GMT). It will be broadcast live on NASA TV and streamed by the websites of both NASA and the National Cathedral. Many dignitaries are expected to attend, including NASA chief Charles Bolden and other NASA officials, political leaders and members of the Armstrong family, space agency officials said. A select few regular folks will make it into the service as well. A "very limited" number of seats will be made available on a first-come, first-served basis, according to a NASA media advisory. People interested in attending should contact Christine Peterson at christine.peterson@nasa.gov. 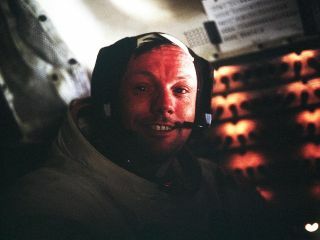 Neil Armstrong rose to international fame when he stepped onto the lunar surface on July 20, 1969. He and Buzz Aldrin spent more than 21 hours on the moon, while fellow Apollo 11 crewmate Michael Collins orbited above in their command module Columbia. The words Armstrong uttered as his boots crunched into the gray lunar dirt — "That's one small step for [a] man, one giant leap for mankind" — are among the most famous ever spoken. The multifaith Washington National Cathedral is a historic landmark, and it already has a connection with Armstrong and the Apollo 11 mission. In 1974, Armstrong, Aldrin and Collins presented the cathedral with a moon rock they had collected on their historic journey, as part of a ceremony commemorating the fifth anniversary of humanity's first steps on the moon.